Slow Cooker Beef Brisket Goulash : Smoked paprika & plenty of peppers transform chunks of inexpensive lean brisket into something special. Serve with noodles & sour cream or a big bowl of creamy mashed potatoes. Well, what a start to 2017 for me. I’d been feeling rather ill over New Year I went to the doctors expecting a prescription of antibiotics to deal with what I thought were painful and infected insect bites. To my surprise the doctor diagnosed shingles and apparently “Shingles is more likely to occur in older people”. It’s one thing being told you’ve got shingles but it’s definitely a bit of a shock when a far from Spring chicken doctor officially declares you as old ! I reckon the upside to being off ill is fancying a heart warming, preferably spicy, meal when you start to recover. So as the antiviral medication began to kick in, I sent OH off to buy some beef and peppers for a favourite comfort meal, goulash in the slow cooker. The slow cooker meant I could still rest during the day and all OH had to do when he got back was cook up some noodles – or, as it turned out, tagliatelle since that was all he could find. This my take on a traditional ghoulash (onions, meat and paprika) because I use tomatoes and peppers. Besides being one of my favourite ingredients, peppers make the stew go a little further and the tomato passata adds a richness with the added benefit of making a lovely thick stew. I use paprika and smoked paprika but if you can’t get hold of smoked, substitute it with paprika. Regular readers will know we love a bit of heat here at the Kitchen Shed so I’ve used one tablespoon of smoked paprika. If you’re not so keen on spicy heat, use half a tablespoon instead – it really is worth using smoked paprika if you can to get a real depth flavour. Beef brisket is inexpensive and cooked in the slow cooker it is transformed into tender chunks of meat which just fall apart. Don’t be put off by brisket as it doesn’t have to be massively fatty and you do need a little bit of fat when slow cooking – lean beef such as rump tends to dry out in a slow cooker. The lovely piece of brisket OH bought from Forest Stores here in Guernsey for just £6.50 had hardly any fat on at all. You tend to find brisket, either on the bone or rolled (which you can just chop up into bite size pieces) in your local butchers rather than the supermarket. Don’t worry if you can’t get hold of brisket as you can use chuck steak or braising steak. Slow Cooker Beef Brisket Goulash really is easy to make. Brisket chunks are tossed in a seasoned paprika flour mix and browned to give lovely pieces of paprika crusted beef that cook with the sauce for a flavour which is much deeper than if you simply added paprika to the passata and stock. Softened onions are added to the slow cooker with the beef along with a bay leaf, stock and passata and then everything is left to cook on low for six to eight hours. I like to add the peppers once the meat is soft and tender as the peppers keep their shape and texture much better this way. If you know you’ll be pushed for time when you get home from work or a day out, you can include the peppers with all the other ingredients at the beginning. For me, I find as long as the peppers are popped in and stirred as soon as I get home, I’ve time for a cuppa and getting the rest of the meal ready. If you don’t fancy noodles, try a big bowl of creamy mashed potatoes or rice. I hope you like Slow Cooker Beef Brisket Goulash as much as we do here at the Kitchen Shed. Slow Cooker Beef Brisket Goulash : Smoked paprika & plenty of peppers transform chunks of inexpensive lean brisket into something special. Serve with noodles and sour cream or a big bowl of creamy mashed potatoes. Add paprika, smoked paprika and salt and pepper to your flour and coat the beef chunks before setting to one side. Heat the oil in a large frying pan on a medium heat. 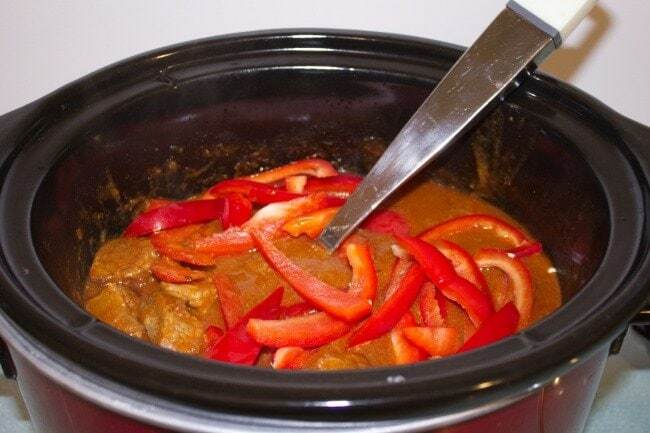 Add the paprika floured beef chunks to your frying pan and brown well before transferring them to the slow cooker. Add a little more oil to your frying pan and soften the onion before adding the tomato puree and crushed garlic. Add the passata and stock to onion mix and warm through before transferring to the slow cooker. Stir well and add the bay leaf and leave to cook with the lid on for 6 to 8 hours on low or 4 to 6 hours on high. Add the sliced red peppers and cider vinegar and stir and cook on high for 1 to 1/1/2 hours with the lid on. After one hour check you peppers are cooked to your liking and the stew is the thickness you like. For a thicker stew add a little cornflour and water and cook with the lid off for another half hour. Serve with soured cream and chopped fresh parsley with buttered noodles or a big bowl of creamy mashed potato. Slow Cooker Beef Brisket Goulash freezes well. Only just catching up with things myself after being unwell over Chrsitmas/new year (just a nasty virus). SOrry to hear you have been unwell too.I had shingles when I was in my teens so not only “old” people get it. Hope your feeling much better now and less old! 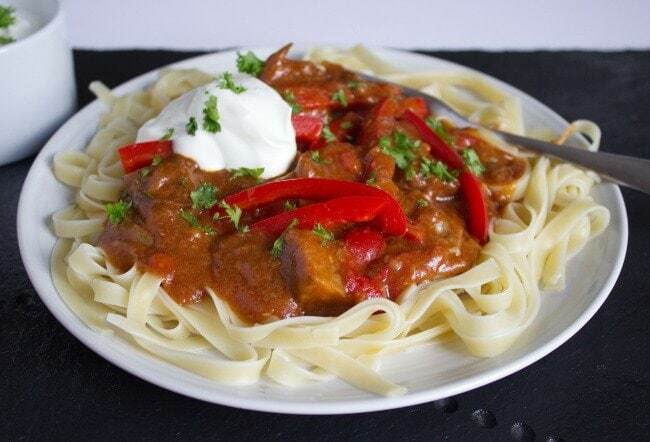 This goulash recipe looks lovely. Like you I like to add tomatoes and lots of peppers. Ive not made it with brisket before though so shall give it a go. I love a good goulash, a great idea to make it in the slow cooker! I love a tasty slow cooker meal like this goulash! also love the fact that I can make a double batch and freeze for another day. Delish! Making a double batch for freezing is a great idea, not only do you have a meal ready for another time but it tastes even better. Oh dear! Sorry to hear you have been going through all that. 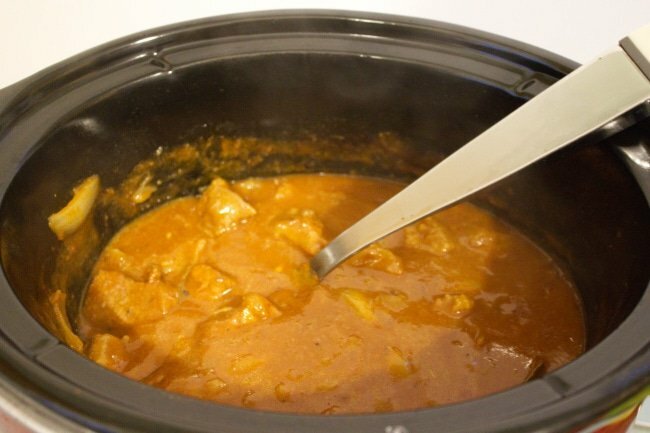 This sounds like a delicious dinner – I love using my slow cooker and am always on the lookout for a new recipe to try in it! Thanks Amy, I’m feeling much better now, thank goodness. 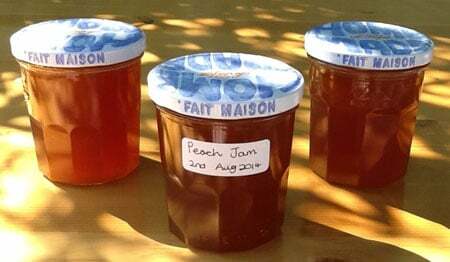 Do let me know if you try the recipe. I love using my slow cooker and never thought I would want to make goulash-till now. 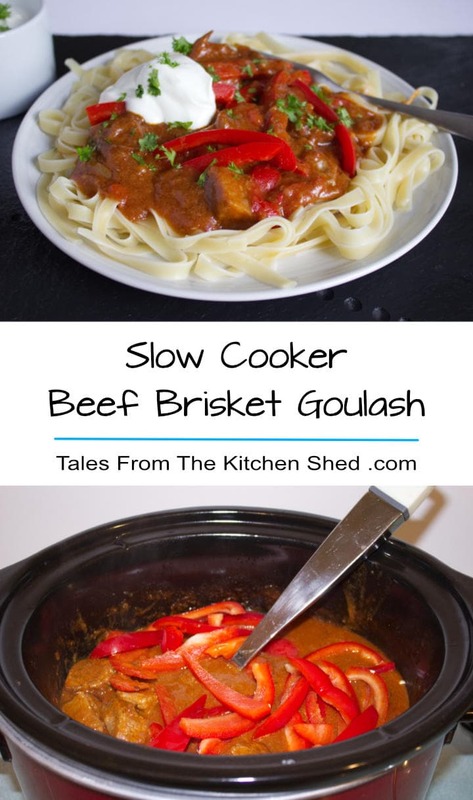 I hope you enjoy my slow cooker goulash as much as we do here at the Kitchen Shed. Thanks for popping by Winona. Awesome use for brisket! Looks like its tastes great! Thanks Derek, brisket is an under rated cut of beef and it really is delicious slow cooked. 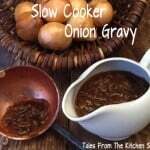 Nice looking idea for taking advantage of your slow cooker! Love smoked paprika also. Thanks Piper, the smoked paprika does add a lovely depth of flavour. My mom used to make goulash when I was growing up! I haven’t had it in years! Sorry to hear that you have been a bit under the weather. I used to work with a lady that also came down with shingles after a brutal case of the flu. . .she was young. So while it is more common in the young at heart. . .it is not unheard of someone young, like yourself ?, to get. Anyhow, I hope this goulash helps you feel better. 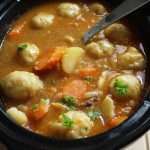 I love using my slow cooker AND I love goulash! 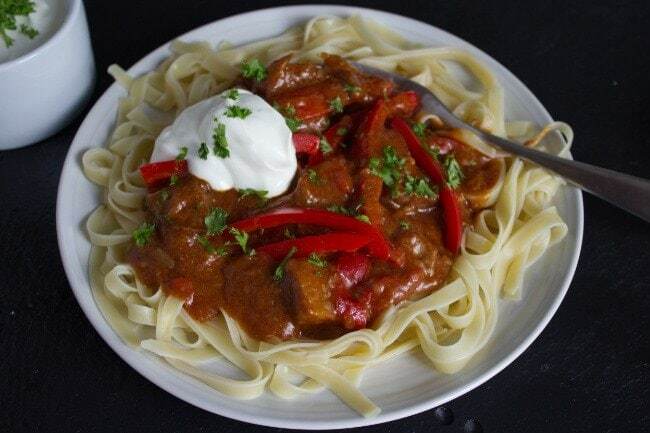 I always make mine with ground beef, can’t wait to try your recipe for brisket goulash, thanks for sharing! Thanks Erica, I haven’t tried goulash with minced beef, I must try it. A pleasure to share the recipe and I hope you like beef brisket goulash as much as we do. Glad to hear you’re feeling better, though the diagnosis “old” probably still stings, I’m guessing. Food like this is the salve of winter and aging, right? Wonderful meal and great instructions. Thanks! 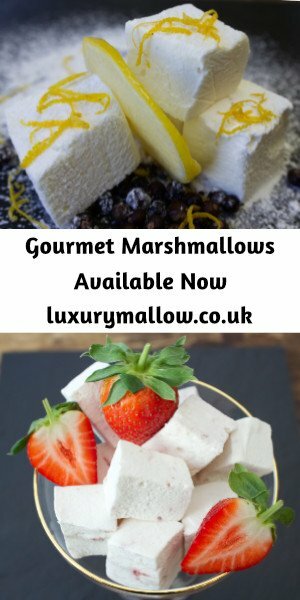 Thanks Lynne, I’m feeling so much better and I’m almost over the thought of being ‘older’ 🙂 I’m pleased you like the recipe and instructions, it’s always difficult to know how much information to put in a recipe so I appreciate the feedback. Since I dont eat beef, I’m thinkin, I will replace beef with chicken. It will still taste amazing. What a good idea, smoked paprika with chicken is delicious. I would shorten the cooking times though to 4 to 6 hours on low or 2 to 3 hours on high as the chicken cooks a lot quicker than beef brisket. Thanks for your suggestion. Slow cookers are awesome. 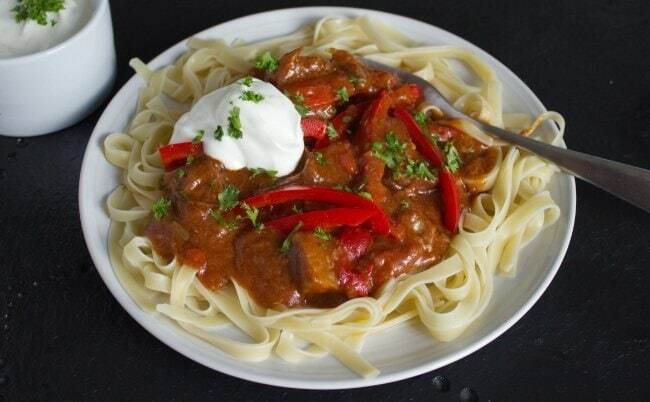 This Goulash sounds delicious…and leftovers are always great too. Thanks Gloria, I wouldn’t be without my slow cooker. The goulash was even better the next day, thanks for popping by. Sorry to read that you haven’t been feeling your best. This is the perfect comfort food. Looks delish! Thanks Tanya, I’m feeling so much better now. Thanks for popping by. I love love love Goulash! Thanks Monika, the passata and smoked paprika really deepens the colour of the sauce as well as the flavour of the sauce. This meal looks so Delish! Thanks Fred, my family really enjoyed it. Mmm I love goulash and your version made with brisket looks just the way I like it. Plenty of sour cream for me please! A great winter warmer. Thanks for linking up with the Slow Cooked Challenge! Thanks Lucy, brisket is one of our favourite meats for the slow cooker and it’s so economical. A pleasure to link up, looking forward to checking out the other recipes. Sorry to hear you’ve not been well, Sarah. Goulash is just the thing to set you up for your recovery and so much better when it’s cooking away itself in the slow cooker. Love the freshness of the peppers added at the end. Thanks for joining us for The Slow Cooked Challenge. Thanks Janice, I’m feeling much better now. The goulash was the first meal I’ve been able to enjoy for awhile, it was just what I needed. A pleasure to link up with the Slow Cooked Challenge.